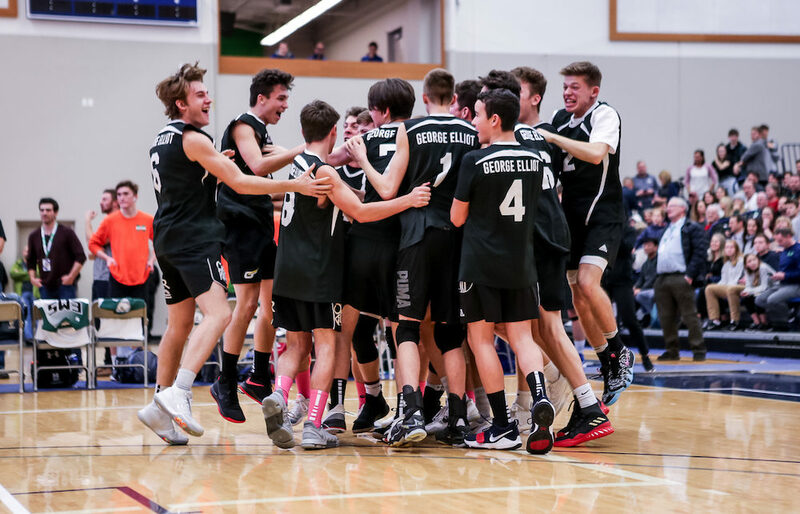 LANGLEY — It promises to be a historic night on Saturday when Lake Country’s George Elliot Coyotes and the Abbotsford Christian Knights square off in the AA final of the 2018 Kahunaverse Sports B.C. Volleyball Championship. 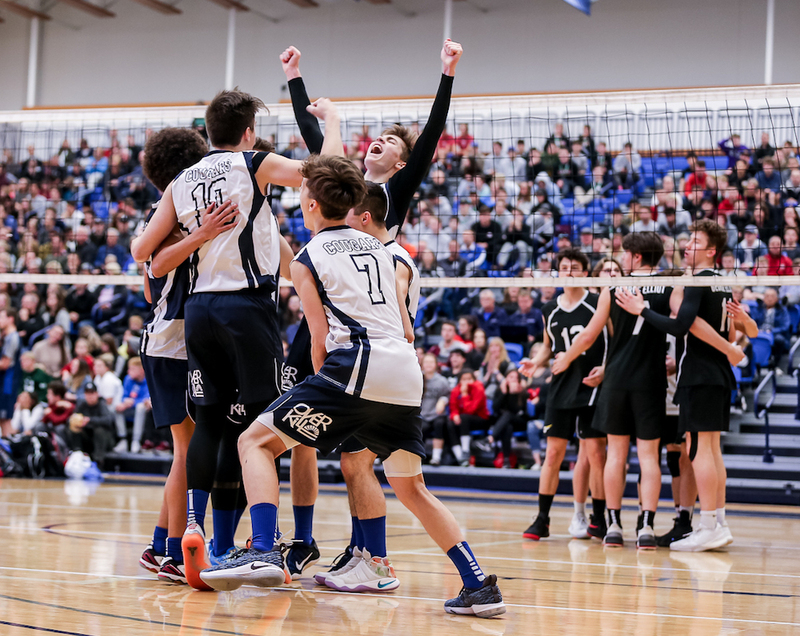 For the first time in their respective senior boys volleyball histories, one of those two schools will be crowned provincial champion as the four-day tournament wraps up at Langley Events Centre. The Knights came agonizingly close in 2017, falling in the championship game. The Coyotes came sixth last year but have not played for gold since 1982’s runners-up finish. They also took second in both 1976 and 1977 and bronze in 1994 and 1995. In Friday’s semifinal, George Elliot, the top team from the Okanagan zone, was up against the North Central champion College Heights Cougars. The Coyotes had won all four previous meetings between the two and looked like they were going to make quick work of their Prince George opponent, taking the first two sets by 25-22 and 25-16. But College Heights rebounded to win 26-24 and 25-23 setting up a fifth and deciding set. Fittingly, it was a back-and-forth set with neither team able to lead by more than two points. And College Heights was up 14-13 and serving for the match. Following a George Elliot timeout, however, the Coyotes staved off elimination and won 17-15. The semifinal victory was also a measure of revenge for the Coyotes, as they were knocked out by the Cougars in last season’s quarterfinals. Frehlick also gave props to his opponent, calling this the best match he had seen College Heights play against them. 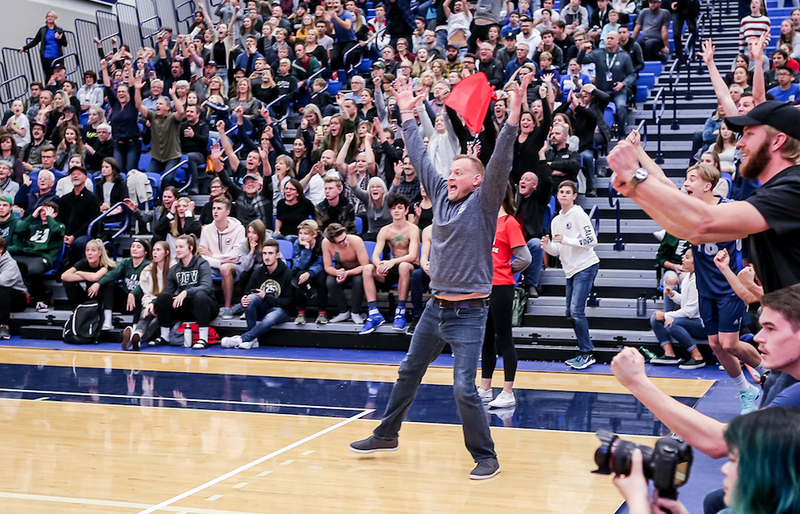 Meanwhile, Abbotsford Christian is making its second consecutive appearance in the title game, and just like George Elliot, the Knights vanquished a familiar foe to earn their spot. 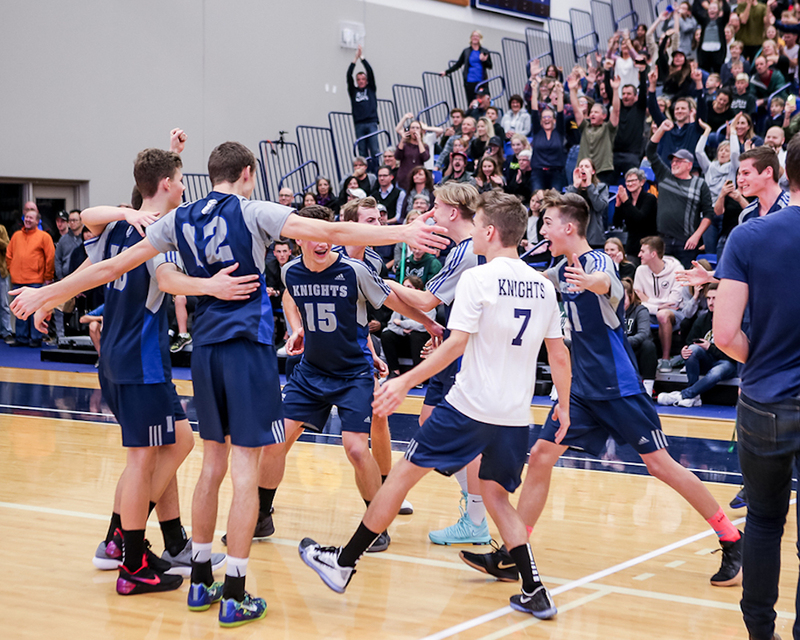 In 2017, Langley Christian denied the Knight a championship but this time it would be Abbotsford Christian defeating their Fraser Valley rival 3-1 (23-25,27-25,25-17,25-20). And in that second set, the Lightning were up 24-23 and serving to go up 2-0 in the best-of-five match but the Knights extended the set and scored four of the final five points to even it at 1-1. While George Elliot entered the provincial championships as the No. 1 seed, the Knights struggled over the final weeks, dropping from third to sixth. Part of the problem has been health-related, the rest confidence. Abby Christian won their pool on Wednesday and then after a straight sets victory over Lambrick Park in the round of 16, survived a tough five-match quarter-final against MEI, another one of their local rivals. “We are healthy now, both physically and emotionally, and I think that makes the world of difference,” Jansen said. The Knights and Coyotes go for gold on Saturday at 4 p.m.
Langley Christian and College Heights will play for bronze at noon.